Today, I'm counting down my five favorite Ginger Rogers-Fred Astaire dance numbers. The photo above shows the legendary duo in Top Hat (1935). This article is part of The 2017 Summer Under the Stars Blogathon hosted by Journeys in Classic Film. Aug. 11 is Rogers' SUTS Day. In nine films for RKO Pictures and one for MGM, Ginger Rogers and Fred Astaire created moments of swoon-worthy romance, taught the nation how to do the Carioca and The Continental, and tap danced like no one before or since I'm celebrating old Hollywood's greatest dance team by listing five of my favorite Astaire-Rogers dance numbers. The list is in chronological order starting with their first film, Flying Down to Rio (1933) and ending with their swan song, The Barkleys of Broadway (1949). As always, feel free to leave your picks in the comments section. Astaire was a Broadway star trying to make it in the movies, and Rogers was a RKO Pictures contract player when they were both assigned small parts in the lavish Latin-American musical Flying Down to Rio. While Dolores del Rio and Gene Raymond were the movie's top-billed stars, Astaire and Rogers stole the show in a two-minute performance to composer Vincent Youmans tune. Choreographer Hermes Pan, who was integral to the success of the Astaire-Rogers films, came up with the idea that Rogers and Astaire should perform the slinky, hip-swinging choreography with their heads together, and to everyone's surprise it became a nationwide sensation. Flying Down to Rio is airing at 7:30 a.m. Aug. 11 on TCM. Also on DVD and video on demand. After the unexpected success of Flying Down to Rio, RKO executives immediately put their newly minted stars back to work on an adaptation of Astaire's stage hit, The Gay Divorce (the name change was required by the movie censors, who felt the original title celebrated the breakup of marriages). While RKO tried to recreate the success of Carioca with The Continental, The Gay Divorcee's real standout number is Night and Day. The song's unusual harmonic structure -- some say composer Cole Porter based it on an Islamic prayer -- combined with Pan's fluid choreography make this a dance of seduction between the two leads. Night and Day is also the best example of the old adage that Rogers did everything Astaire did, except "backwards and in high heels." Available on DVD and video on demand. Not all of Astaire and Rogers' numbers were ballroom dances. They were both first-rate tap dancers, which they proved in this light-hearted Irving Berlin tune that comes near the beginning of Top Hat. Top Hat is airing at 10 p.m. Aug. 11 on TCM. Also available on DVD and video on demand. 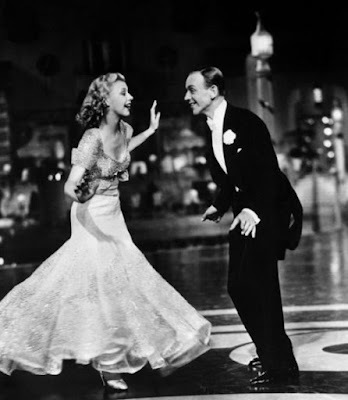 Perhaps Astaire and Rogers finest onscreen moment is their breathtaking dance to Irving Berlin's bittersweet song, Let's Face the Music and Dance. Astaire and Rogers completed this number in one continuous take (although they performed the number an exhausting total of 24 times, what you're seeing is their first attempt). Their elegant perfection came despite the fact that Rogers was wearing a beaded dress that weighed 25 pounds and that her sleeves kept hitting Astaire in the face throughout the performance. Follow the Fleet is airing at 2:15 p.m. Aug. 11 on TCM. Also available on DVD and video on demand. Astaire and Rogers parted ways for 10 years after their final RKO film, The Story of Vernon and Irene Castle (1939). They both went on to outstanding success as solo stars, but, after an ill Judy Garland had to drop out of the musical biopic The Barkleys of Broadway, Rogers stepped in for what would be the duo's last film together. Astaire and Rogers' final number is the melancholy George and Ira Gershwin song, They Can't Take That Away from Me, which was introduced by Astaire in Shall We Dance (1937). In The Barkleys of Broadway, it serves as a sentimental farewell from two of old Hollywood's greatest legends. The Barkleys of Broadway is available on DVD and video on demand. I You must have had a lot of fun writing this post. It is marvelous to read. I knew you'd have the glorious Let's Face the Music and Dance. Didn't expect Isn't it a Lovely Day to be Caught in the Rain, but agree 100%. Fred and Ginger had so much fun dancing that it's hard not to have fun writing about them! I don't know how you were able to limit this list to five. Fred and Ginger dancing together is pure joy! I hope you rewatched each of these as you put it together, these movies are delightful. I love all your selections! But can we have 6? If so, I nominate the marvelous, seemingly impromptu and unrehearsed "I'll Be Hard to Handle" from Roberta. It's a joy! We sure can! I haven't watched Roberta in awhile, but you've encouraged me to revisit it.